It’s time, you’re looking for a new revenue cycle software solution. Perhaps you’re deciding between in-house or outsourced billing. Maybe you’re searching for an upgrade from your current solution. Whatever the case may be, you’re probably feeling a little overwhelmed right now… or a lot. Narrowing down your options is no easy feat. At the end of the day, your top priority is providing care to your patients, but the financial aspect of your business should never be placed on the back-burner. So, what should you really focus on when choosing a billing partner? 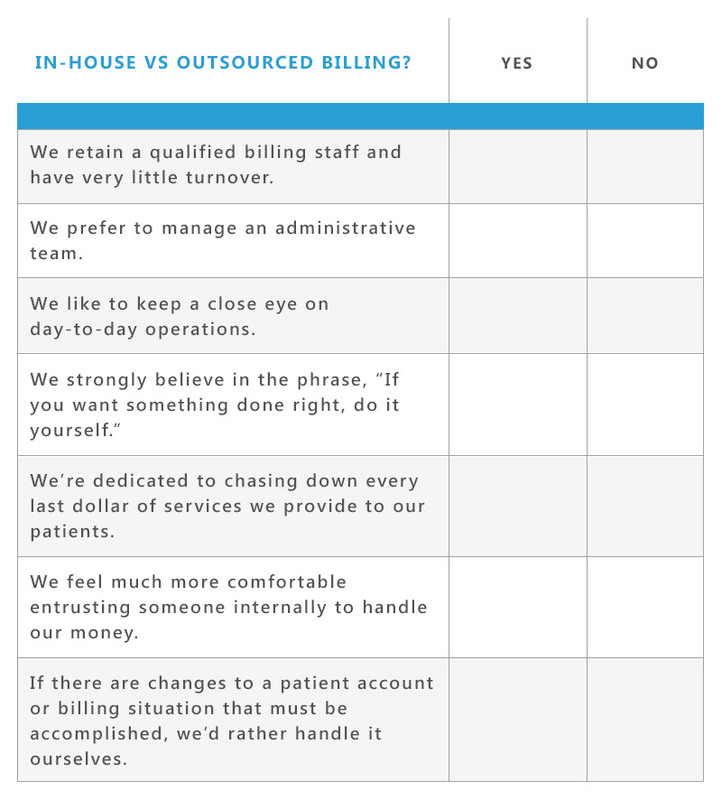 If you answered “Yes” to the majority of these questions, you should consider in-house billing. You have total control over your billing operations – make immediate changes and essentially have your hands in the heart of your practice. Alternatively, if you answered “No”, consider outsourcing instead. You’ll only have a single point of responsibility to manage your billing process and you have more time to focus on patients. Neither option is perfect, however. In-house billing exposes your practice to more liability and disruption of operational and business continuity due to sickness, medical leave, vacations, etc. Outsourcing your billing could leave you feeling disconnected from a crucial part of your business. Ultimately, you’re still responsible for filed claims and the representation of those claims. If you relinquish too much responsibility and your billing service doesn’t educate you to validate that they’re representing you properly, you could be left in the dark. At the end of the day, it’s all about preference – management style, budget, and how much responsibility your practice is willing to take on or give up. So you've decided to keep your revenue cycle management solution in-house. What are some factors to consider when choosing between available RCM vendors? Cost - Does the provider offer flexible purchasing options that align with your budget and needs? Be sure to clarify which product, service, and maintenance fees are considered “added offerings” so that you have a clear idea of exactly how much you will be paying for. Services Offered - Does the company offer a solution that covers every step of your revenue cycle? RCM and practice management solutions should be all encompassing – with products and services that span from registration, to patient care, to patient follow-up. Transparency - There’s a lot to be said about a company that is upfront about costs and the services it provides. This is especially important if you decide to outsource your billing. You should be able to maintain ownership of all billing data, with full visibility into your A/R, and have access to comprehensive reporting and analytics. Security - Your patients trust you with the most sensitive and personal details of their health. Maintaining that trust is everything when it comes to patient relationships and the reputation of your business. It’s crucial that you choose a partner that is in compliance with government privacy laws and HIPAA regulations. Ask about cybersecurity and infrastructure support too – well-rounded solutions also provide these services to help you manage PHI. Staying Ahead of The Game - The healthcare industry is constantly changing, and so will the needs of your business. That’s why it’s so important to have a billing partner that moves with you to keep up with the challenges that your practice will face. Companies that offer solutions centered around the patient experience – like online payment portals and patient payment plans – recognize a huge pain point the industry is facing in terms of patient financial responsibility. Validation - It’s great when a company’s services are validated by third-party organizations, but what about current customers? As you narrow your search, it’s helpful to look for client testimonials and case studies on each company’s website. That’s where you’ll find honest opinion. If they don’t provide them online, call and ask. A company willing to provide you with the email or phone number to a current client is often times a clear indicator of their client relationships and level of satisfaction. At the end of the day, no matter what company you choose, a knowledgeable and supportive team is your greatest asset, whether it’s support and implementation for an in-house solution or for an outsourcing billing company. You’re entrusting a third party with one of the most important parts of your business. A billing and practice management provider is the equivalent to a partner, and should be as interested in ensuring the success of your business as you are. I need to be completely honest. Before I started working for a healthcare IT company, I didn’t think social media – in regards to the healthcare industry overall – went far past Obamacare memes and horror stories about people misdiagnosing themselves after plunging into the dark depths of WebMD. It turns out that it’s a little more complex than that! Social platforms are the perfect place for patients and healthcare professionals to communicate about health issues and possibly improve health outcomes. Which makes sense, because patients are turning to the internet now more than ever to research health information. Personally, I can’t remember the last time I didn’t walk into a doctor’s office and say to the nurse, “These are the symptoms I’m experiencing and this is what I think I have based on my own research.” Now, think about the potential there. There’s a giant gap that providers can fill if more of them are socially active online. The key here is to provide me with information where I’m already looking for it. We can’t be ignored! Patients are using the internet to research health information. Remain HIPAA compliant – The most obvious being patient privacy protection. You can’t actually address your patients directly through social media as it violates confidentiality regulations outlined by HIPAA. ALWAYS keep this in mind, especially if other employees are posting for you. Distribute clear social networking policies to employees and avoid all discussion of patients, even in the most general of terms. Have no fear, there are plenty of unique and compliant ways to utilize social platforms to the benefit of your organization. We’ll get to those in a minute. Remain professional at all times – When you’re putting yourself out there on social media, especially as a business, there WILL be patients, colleagues and other professionals that challenge and disagree with you. I can say from experience as a social media strategist – and I think this is pretty universal for all types of businesses – honesty is the best policy. If someone disagrees with you online, you’ll provide yourself with a lot more credibility by recognizing their alternative opinion and providing a respectful counterargument, as opposed to ignoring them. However, if someone is blatantly disrespectful or inappropriate, that’s a different story. Again, you should train employees on how to handle these type of situations so everyone is on the same page. Remember, your reputation is on the line here, so proceed with extreme caution. Don’t let this shy you away, Dr. Z has been in the game for a long time! If you’re brand new to social media from your organization’s perspective, you don’t need choreographed music videos to provide quality content online. Regular Facebook, Twitter, Linkedin, and blog posts are a great starting point. At the end of the day, sharing trustworthy and valuable content is what’s most important here. With all the false health information floating around the web, sharing reliable and reader-friendly material can help serve and protect your community and beyond. Highlight your staff and services. Value-based care is more prominent than ever, and with the rising importance of patient engagement, quality healthcare is crucial. Use social media channels to highlight your expertise! Promote blog posts written by specialists, post videos about your particular services and how they can benefit potential patients, host Q&A sessions about important health issues... the options are endless. Expand your professional network. Social media is an excellent way to connect with other experts in your field. Linkedin and Facebook private groups are easy means of connection, but let’s expand a little. There are tons of awesome apps out there that connect professionals in a community environment. The app Figure 1 – Medical Images lets physicians looking for feedback on rare conditions or seeking insight about specific cases share medical images with one another. The app also guarantees patient privacy with automatic face-blocking and removal of identifying information. How cool is that? Connectivity on the go that’s HIPAA compliant! Discover strengths and weaknesses. Truthfully, people are probably talking about your organization online and you don’t even realize it. This is great for two reasons. On one hand, patients may be raving about the quality care they or a loved one received. On the other, they could be grumbling. If the latter, this is a great way to respond to those complaints in real time, letting those individuals know that you care. Now, I know that you may be thinking, “I don’t have time for this,” but consider the many benefits mentioned that are involved in your organization having an online presence. If you’re concerned that such engagement will really take up too much of your time, schedule posts in advance using platforms like Hootsuite. In the end, regularly posting quality content won’t be a waste of your time. If possible, putting the specialist – like a radiologist – in charge of social media efforts is ideal. When the specialist directly controls content, you’re ensuring that posts are relevant to your organization’s industry, culture and goals. You’re also significantly improving potential patient engagement. Again, this is where scheduling becomes incredibly important. When patients are actively engaged in their own healthcare, outcomes improve. Create a special relationship with other industry leaders and potential patients. Get social! Radiology Partners is a multi-state hospital-based practice, with more than 350 radiologists serving approximately 280 hospitals and outpatient centers nationwide. They offer diagnostic and interventional radiology services, with on-site and remote reads by local radiologists. With HonorCare®, an affordable patient payment plan, Rad Partners saw results right away. It streamlined and automated payment processes for the company, while saving patients money and making it easier for them to pay their medical bills. Imagine this: You walk into your doctor’s office with a pain in your chest. After discussing your symptoms, your doctor inputs said information into a computer, which immediately provides the latest research on how she might diagnose and treat your problem. Based on the combination of her knowledge and experience, plus the information provided by the computer, she determines that you need a chest X-ray, and the computer again helps the radiologist detect discrepancies that may be too small to the naked eye. Finally, the computer pulls your personal medical records, family history and compares that with recent research to suggest a treatment protocol that’s tailored to your specific needs. Sounds like a scenario straight out of a futuristic movie with robots and flying cars, right? Believe it or not, that technology is in the NOW, and it’s called Machine Learning. Are Radiologists Being Replaced By Computers? In short, machine learning is a form of artificial intelligence (AI) that involves teaching a computer to perform a specific, known task. It basically gives computers the ability to learn without being explicitly programmed. The computer is given algorithms, which create models based on example inputs in order to derive data-driven predictions and decisions. Machine learning methods use statistical learning to identify boundaries. One method for making predictions is called a decision tree, which uses a series of if-then statements to identify boundaries and define patterns in the data. For example, if a patient’s X-ray shows a cortical disruption along with a fine line of increased density, then the patient has suffered a stress fracture. Decision trees look at one variable at a time, then split the data into two branches base on some value, which is then categorized accordingly. Meaning you can train the computer to help a radiologist identify the fracture. Pretty cool, right? It’s one of many ways ML will become part of the daily clinical diagnostic support routine. Supervised Learning. Similar to humans, machine learning algorithms can learn through providing an input and desired output. Think: chest x-rays (input) and diagnosis (output). This data is given to the computer by a supervisor, and the computer learns general rules that discriminate between potential diagnoses. To put it simply, the computer learns from what is known, like studying for a test! If a trainee studies diagnosis-proven cases, they’re more likely to identify a diagnosis on their own. The more they study, the better and their ability to identify an accurate diagnosis will be. But this doesn’t happen overnight. Similar to a radiologist in training that must go through years of study and residency, computers must be trained on thousands of cases before it can accurately diagnose a patient. Unsupervised Learning. When a computer experiences unsupervised learning, the inputs may be the same but no outputs are provided. The computer must figure out the possible diagnoses on its own, and how to discriminate amongst them. Instead of trying to learn from what is known, the computer must learn from what is unknown in the data. This is what leads to innovation and knowledge discovery. In comparison, supervised learning is quicker in terms of output and takes advantage of prior knowledge in radiologic diagnoses, but it’s very limited in identifying new patterns of disease. What Does it All Mean for the Future of Radiology AI in Healthcare? Machine learning is still fresh to radiology, but that will rapidly change with the increased ability of machine learning algorithms. Somewhere in the not so distant future, machine learning will play a large role in routine workflow and providing real-time diagnostic support to radiologists – especially in the detection and diagnosis of disease. With the movement towards value-based care, there’s a huge push for improved quality and greater efficiency, driving major change in the world of radiology. Machine learning technology will be able to reduce human error, identifying image information that may be indistinguishable to the human eye. There’s a lot of room for improvement, since radiologists are reading 20% more cases per day than they did 10 years ago and view twice as many images (RSNA) to meet the demand for imaging services. ML technology will enable radiologists to work more efficiently and produce better reports; taking on tasks that were once assumed to require human thinking, including interpreting image information. Radiologist Nick Bryan, M.D., Ph.D., predicted in 2016 that in the next decade all medical imaging will be reviewed by a machine prior to being studied by a radiologist. While starting small within niche tasks and subspecialties, these programs will eventually grow to incorporate more broad forms of diagnostic imaging like detecting abnormalities and interpreting them against clinical and pathological information. Researchers at UCLA are using machine learning in the form of chatbots to provide answers to patients’ questions relating to interventional radiology treatment. Once widely available, this research could help reduce the time interventional radiologists spend on the phone and give more convenient access to evidence-based information needed to care for patients. Will Radiologists Be Needed in the Future? Innovation in machine learning is not meant to replace a human being, rather enable radiologists to detect medical conditions sooner. This could potentially allow for earlier intervention and better patient outcomes. At the end of the day, the human brain has extraordinary capabilities to work with data, assimilate information, conjure scenarios, and solve complex problems well beyond any artificial intelligence. However, we are only human, which means we WILL mess up. The future of humans in radiology looks bright. Machine learning technology can certainly reduce human error and analyze increasingly complex imaging examinations. Machine learning is really meant to complement the abilities of radiologists; working together to improve outcomes, transform radiology, and change the way we think about providing care. CHARLOTTE, NC – ImagineSoftware Senior Management Consultant Steve Schreiber has been recognized as a 2013 Fellow of the Radiology Business Management Association (RBMA). Schreiber, along with the four other members of the 2013 class of Fellows, was inducted during the RBMA 2013 Radiology Summit in May in Colorado Springs, CO.
CHARLOTTE, NC – Inc. Magazine has recognized ImagineSoftware on its seventh annual Inc. 500|5000, an exclusive ranking of the nation's fastest-growing private companies. The list represents a comprehensive look at the most important segment of the economy—America's independent entrepreneurs. Imagine joins an elite list of organizations, including LivingSocial, Edible Arrangements, CDW and Lifelock, among other prominent brands featured on this year's Inc. 500|5000. Delaney Radiology has been in business almost 25 years. We currently have 21 radiologists and two imaging centers. We also read at five different hospitals. Since implementing Imagine in October of 2009, we are getting caught up and we haven’t really heard those words in a long time.